When it’s hot outside, it’s a sauna inside, and today has been one of those days. Living on the top floor, the high temperatures make this place like an oven…I did not feel like turning on the oven tonight, but I had this halibut that I needed to cook and figured I might as well be brave and start cooking anyway. I ended up cooking almost naked but that did not help with the heat. There is no air conditioning in San Francisco houses or apartments because most of the time, they don’t need it, but it would come in handy sometimes. 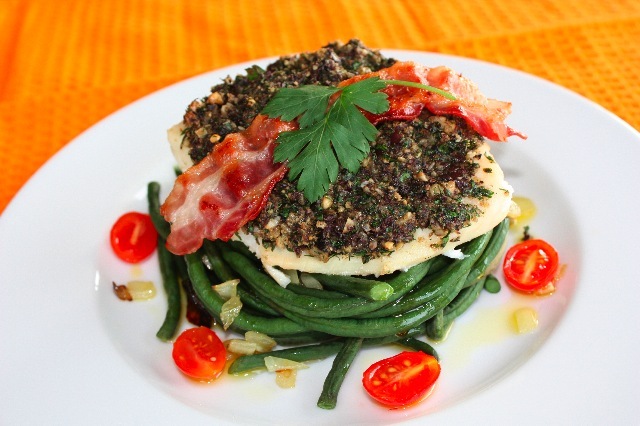 Going back to Halibut, its flesh remains firm and does not break like cod would, the olive crust is infused with many herbs and is wonderful with the white fish as well as the crunchy and crispy textures of Chinese long beans. I like to cook them once in a while, you can make fun presentations and they always remain crunchy, it feels like eating thick spaghetti! I had a similar fish dish with flavorful crust at a restaurant in Paris some time ago and I always wanted to re-create something similar. Not sure it came out exactly like it, but it was delicious anyway. Add salt and pepper to the halibut. In a mixer, add herbs, walnuts, olives, garlic, olive oil, salt and pepper. Mix all ingredients to a fine to medium consistency. Add breadcrumbs, add salt and pepper if needed, (the olives being salty, if you don’t want to much salt, don’t add any). Placea good portion of the mixture on the top halibut surface (about 1/2 inch thinkness for the crust). Cook in the oven at about 380F for 10-15 minutes until the fish is just cooked but do not overcooked, it will get dry. Cut the extremities of the beans. Bring a large pot to a boil, cook beans for 5-10 minutes, do not over cook, they need to still be firm but not undercooked. Place in ice water to keep the beans green (they will darken if left out too long). In a pan, add olive oil, brown shallots until they become translucent and browned, add garlic and stir (do not burn it). Add long beans and mix well. Add salt and pepper. This entry was posted by silvia on April 22, 2009 at 10:53 pm, and is filed under Fish/Seafood. Follow any responses to this post through RSS 2.0.You can leave a response or trackback from your own site. as usually,a very rafinated and elegant dish!i wish you a very good week! Finalmente una ottima ricetta per preparare l’halibut. Probabilmente dovrò sostituire i fagiolini cinesi (qui non li trovo) con i nostrani, ma credo che il gusto rimarrà molto simile. Io aggiungerei solo qualche goccia di aceto balsamico, che ne pensi? I don’t think there is a food in the world you can’t make look gorgeous….another winning piece…beautiful! This is lovely. I like the crunchy bacon topping! I love it! Kalamata olives and walnuts for the crust is just gorgeous. Simple, flavor but fast. Even if I don’t like to cook in the middle of the heat, I still do. Thanks Alison, same to you! Thanks! I give credit to the wonderful natural light I have…I have bay windows all over, and that really helps! Thanks Divina, cooking in the heat is no fun, but sometimes you just have to do it! Grazie Alessandro! ho usato i fagiolini cinesi solo perche’ mi piaceva l’idea di potere usarli come gli spaghetti e arrotolarli, ma il gusto e’ simile agli altri fagiolini. Certo, l’aceto balsamico sarebbe il tocco finale perfetto. This caught my eye because I love olives, walnuts and halibut. Wonderful. Just the kind of dish I like to eat.